On a Saturday afternoon, probably in the summer of 1891 or 1892, the writer Bernard Alfieri set off from his Cricklewood home in London to catch the train to Potters Bar. 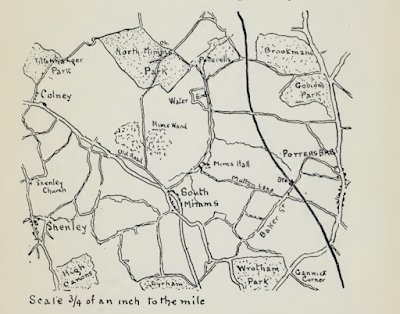 He'd plotted a walk that would take him from Potters Bar, through Water End, past St Mary's Church, over to South Mimms, through Shenley, and on to Radlett, where he would catch the train home. 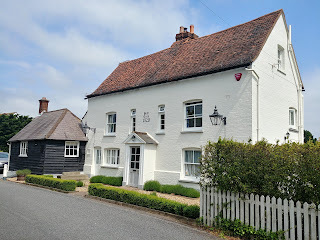 125 years later, we've retraced his steps from Potters Bar through the North Mymms part of the walk to compare and contrast what he saw and wrote about then with what the modern-day rambler is likely to see. At the time Bernard was working on a book to be called 'Half-holidays with the camera'. 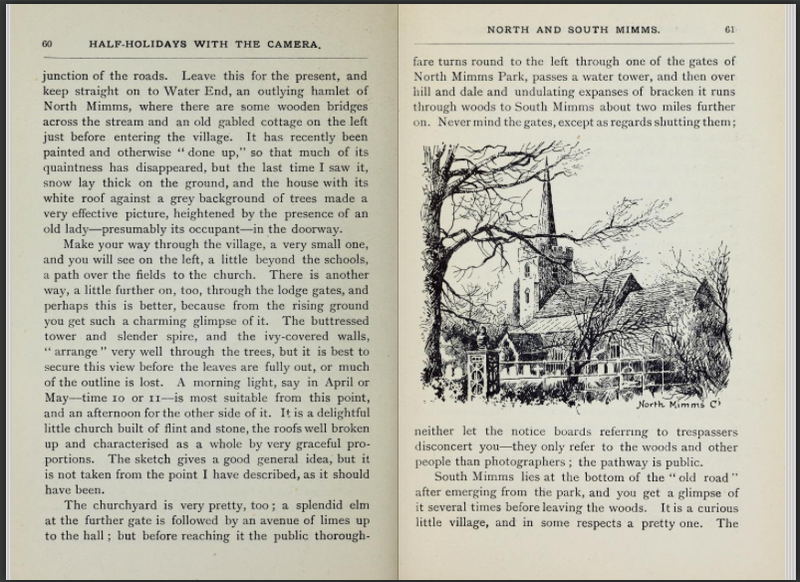 At first it seems a strange title, because there are no photographs in the book, just maps and 50 pen and ink sketches, including the one of St Mary's Church, North Mymms (above). But the book was never meant to be a collection of photographs. 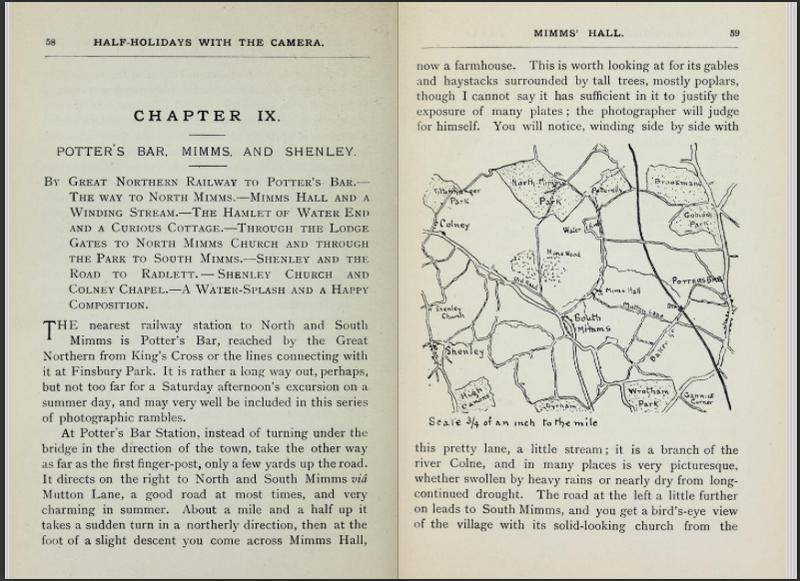 Its purpose was to list photogenic landscapes, villages, and buildings within a train ride of the capital. 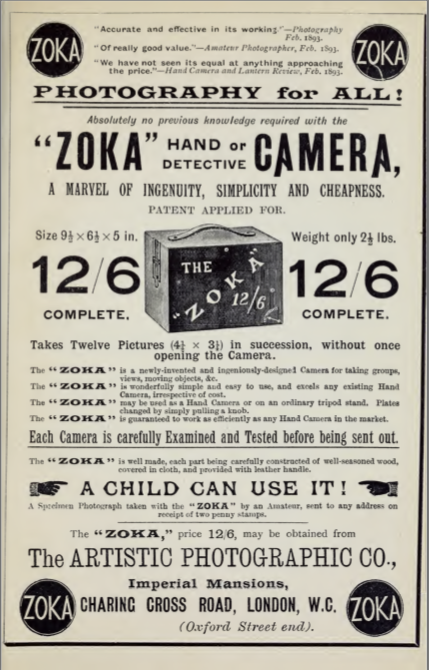 And it was part-funded by the half dozen photography-related adverts at the front and back of the book, such as the two below. So the target audience was clear; people who could afford cameras and were able to travel. 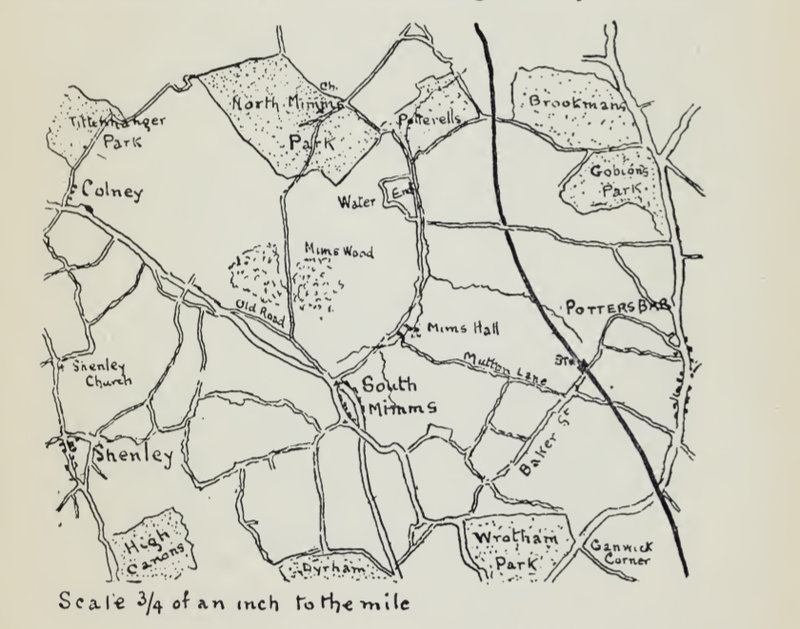 Bernard's description of the route through North Mimms, as it was known at the time, along with a hand-drawn map, were to make up chapter nine called 'Potter's Bar, Mimms, and Shenley'. Note the possessive use of the apostrophe in Potter's, dropped in modern times. Bernard had walked the route before. 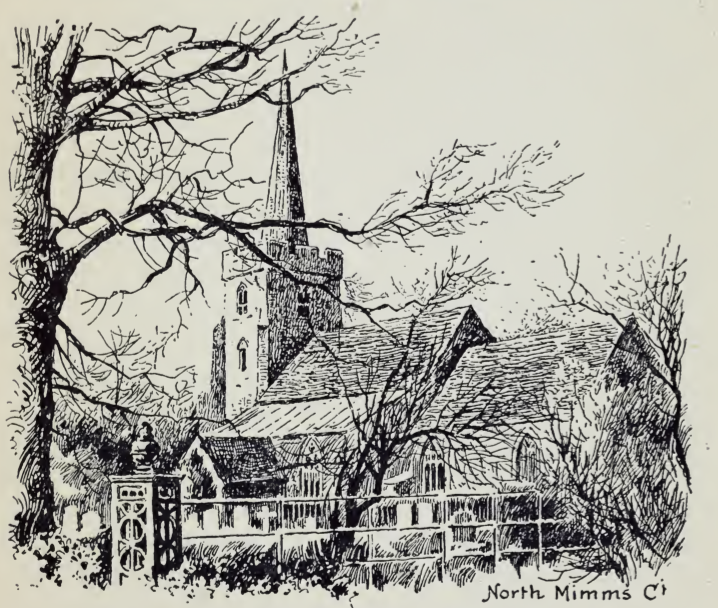 He writes about visiting North Mymms in the snow, and again in the spring when he suggests the best time for taking photographs of St Mary's Church is in the mid morning. So he was familiar with the landscape. 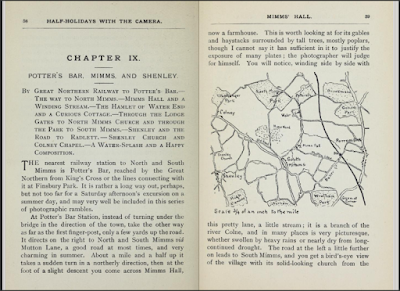 Throughout this piece we set out Bernard's description of the route in italics, and add pictures taken in the early 1900s - soon after he would have done his walk - along with pictures taken in May 2018. 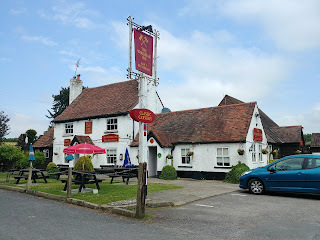 "The nearest railway station to North and South Mimms is Potter’s Bar, reached by the Great Northern from King’s Cross or the lines connecting with it at Finsbury Park. It is rather a long way out, perhaps, but not too far for a Saturday afternoon’s excursion on a summer day." 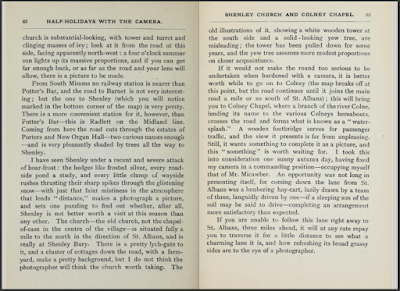 Interesting that Bernard saw the trip as an "afternoon's excursion", because the route of the walk he describes is at least 10 miles long. We have covered just six miles of his route, joining it at Potters Bar station, and leaving it at South Mimms where, on the return leg, Bernard headed south-west to Radlett, to catch a train home. "At Potter's Bar Station, instead of turning under the bridge in the direction of the town, take the other way as far as the first finger-post, only a few yards up the road. 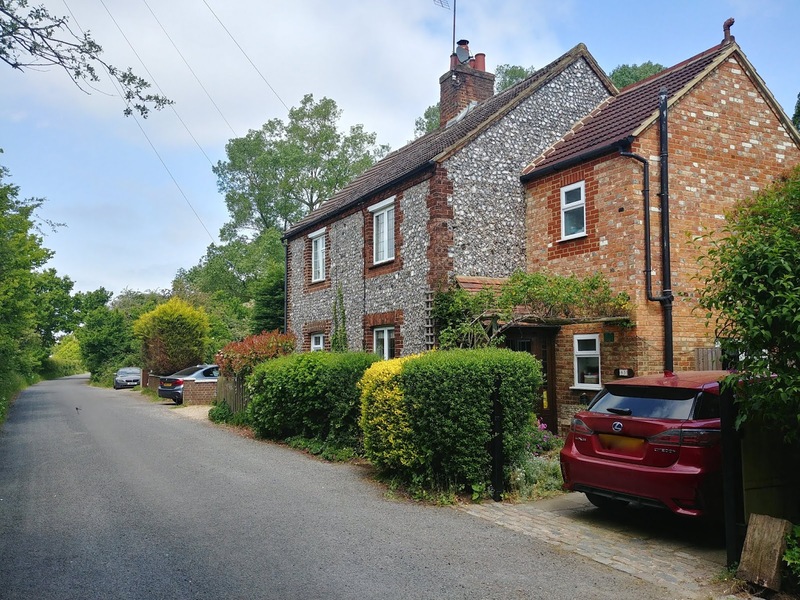 It directs on the right to North and South Mimms via Mutton Lane, a good road at most times, and very charming in summer." 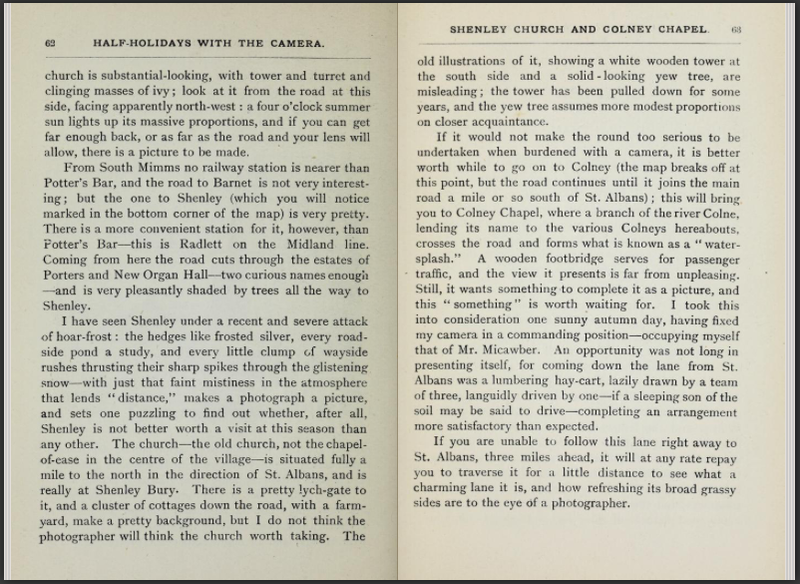 The 'charm' has certainly deserted Mutton Lane since Bernard took the route he describes 125 years ago. Now it's a busy road, and not much fun for the walker. 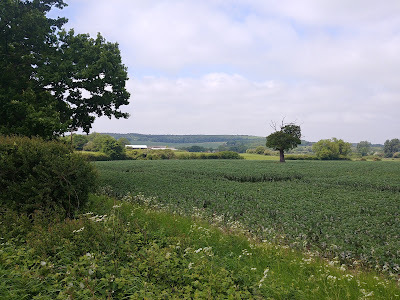 But, once past Furzefield, the views open up offering a hint of what Bernard might have been describing. "About a mile and a half up it takes a sudden turn in a northerly direction, then at the foot of a slight descent you come across Mimms Hall, now a farmhouse. This is worth looking at for its gables and haystacks surrounded by tall trees, mostly poplars." 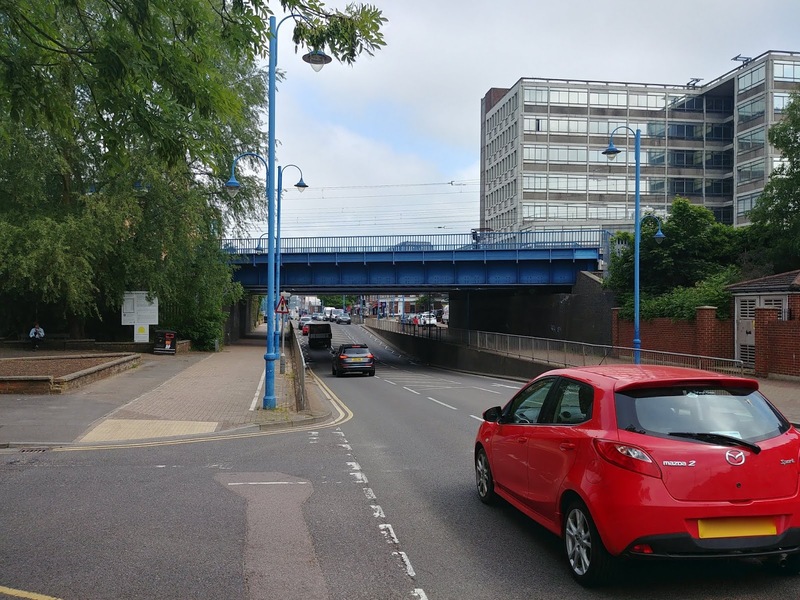 Bernard would probably have walked down Warrengate Lane, now a busy cut-through to Swanland Road, although the traffic can be avoided by taking a footpath that skirts Mimms Hall affording views of the old building. Perhaps this is the route Bernard too, because he may have not been able to see the detail he described from the lane. 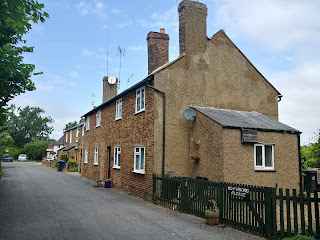 "You will notice, winding side by side with this pretty lane, a little stream it is a branch of the river Colne, and in many places is very picturesque, whether swollen by heavy rains or nearly dry from long-continued drought." At the bottom of the path, where it joins Warrengate Lane and meets the bridge over Mimmshall Brook, is a small cottage that would have been there when Bernard walked this way. Nowadays it's a cattery. 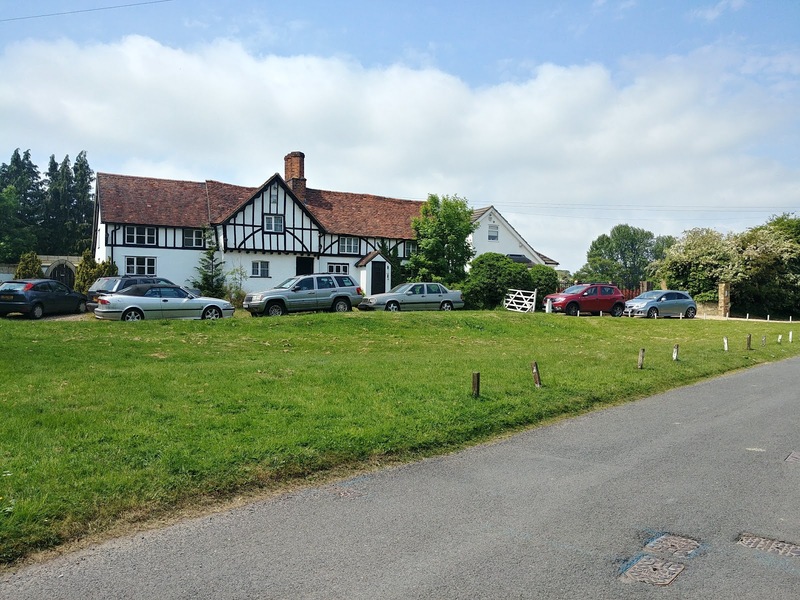 "Keep straight on to Water End, an outlying hamlet of North Mimms, where there are some wooden bridges across the stream and an old gabled cottage on the left just before entering the village. It has recently been painted and otherwise done up so that much of its quaintness has disappeared, but the last time I saw it, snow lay thick on the ground, and the house with its white roof against a grey background of trees made a very effective picture, heightened by the presence of an old lady - presumably its occupant - in the doorway." 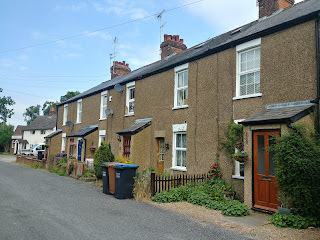 Bernard was probably writing about the row of cottages known as Mother Chuck's Cottages on the west side of Warrengate Road just before the junction with Bradmore Lane. 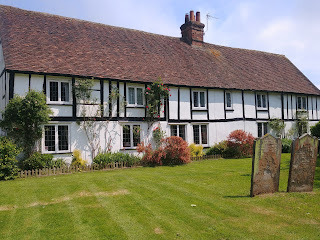 "Make your way through the village, a very small one and you will see on the left, a little beyond the schools, a path over the fields to the church." 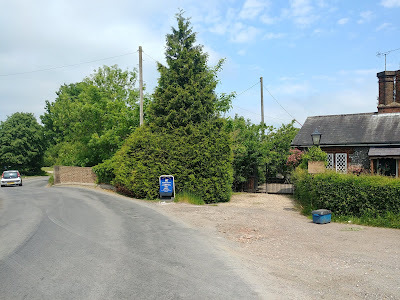 That route is now blocked by Swanland Road and the A1 (M), but today's walker can still follow Bernard's directions by taking a footpath over the motorway to Tollgate Road and the footpath over the fields he was referring to. 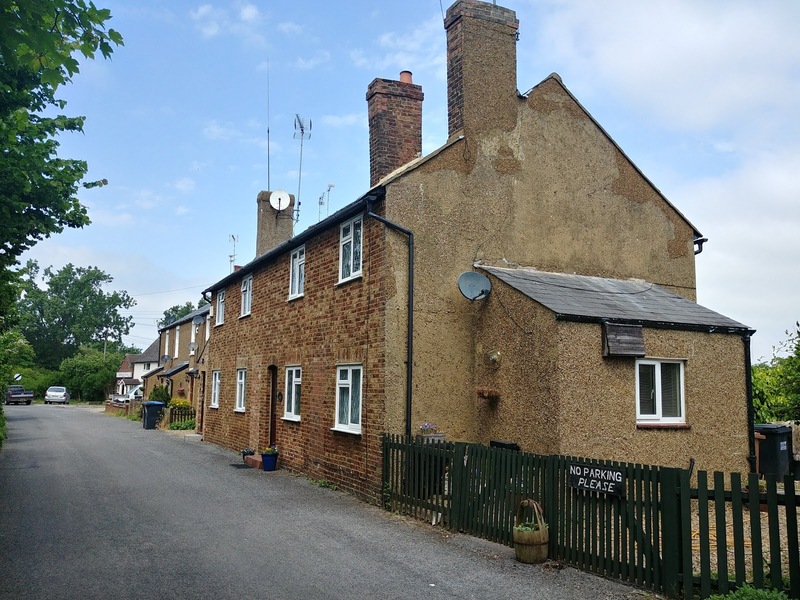 Below a few pictures of Water End cottages past and present along with the footpath over to the church. "There is another way, a little further on, too, through the lodge gates, and perhaps this is better, because from the rising ground you get such a charming glimpse of it. 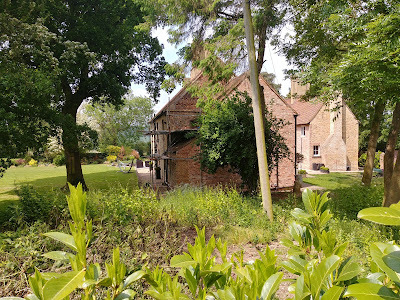 The buttressed tower and slender spire, and the ivy-covered walls, arranged very well through the trees, but it is best to secure this view before the leaves are fully out, or much of the outline is lost. A morning light, say in April or May—time 10 or 11—is most suitable from this point, and an afternoon for the other side of it. It is a delightful little church built of flint and stone, the roofs well broken up and characterised as a whole by very graceful proportions." Bernard offered a slight detour at this point to view St Mary's Church from what he feels is a more photogenic angle. 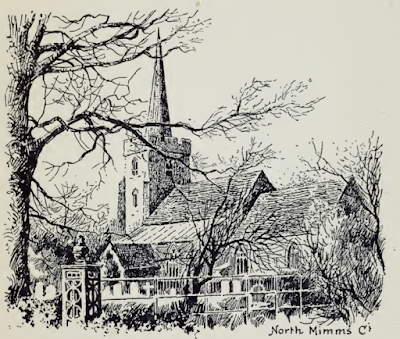 "The churchyard is very pretty too, a splendid elm at the further gate is followed by an avenue of limes up to the hall but before reaching it the public thorough fare turns round to the left through one of the gates of North Mimms Park, passes a water tower, and then over hill and dale and undulating expanses of bracken it runs through woods to South Mimms about two miles further on." 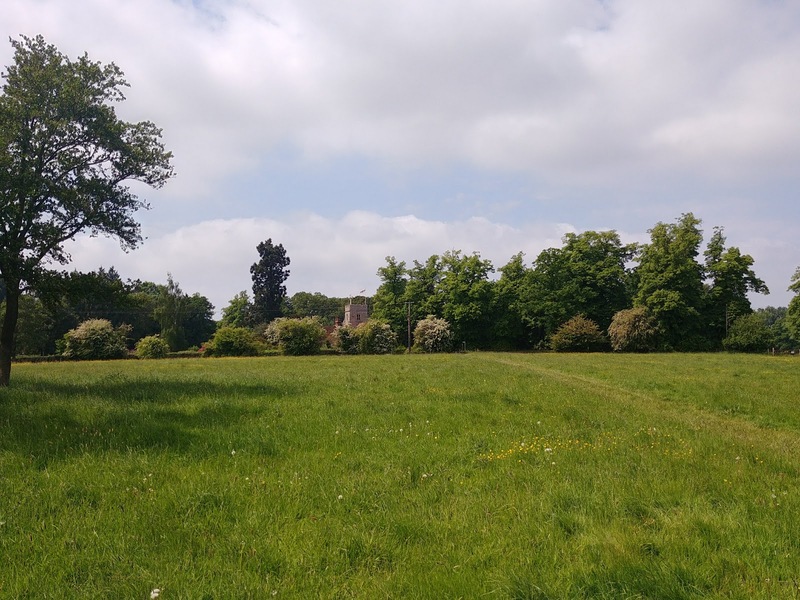 Bernard is describing the bridlepath that runs south from North Mymms church to South Mimms, which is now a paved lane until the bend to North Mymms Park. At that point it's a gated track that climbs and passes woodland and crosses a valley before descending to Blackhorse Lane. 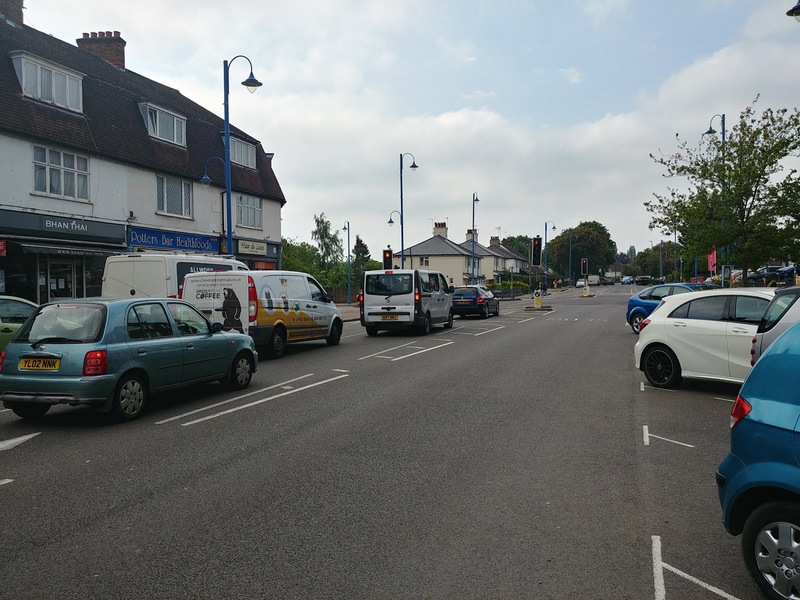 "South Mimms lies at the bottom of the old road. After emerging from the park, and you get a glimpse of it several times before leaving the woods. 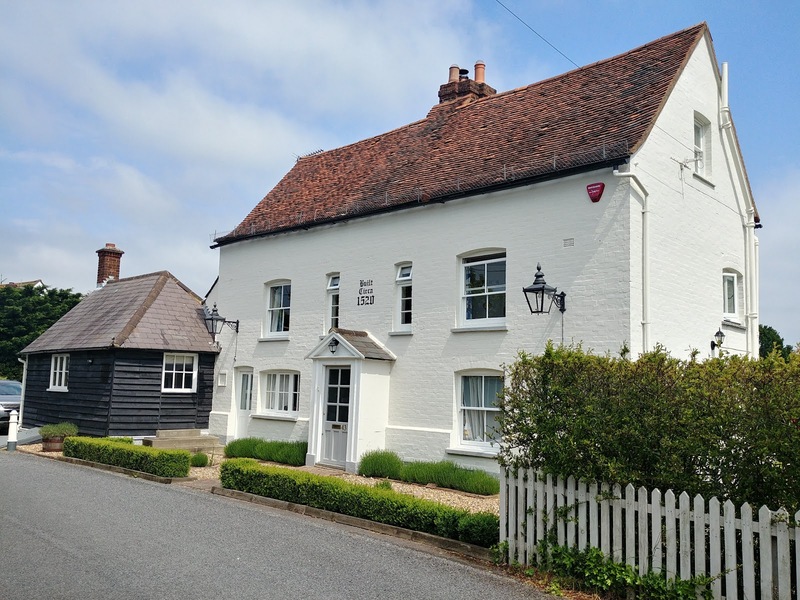 It is a curious little village, and in some respects a pretty one. 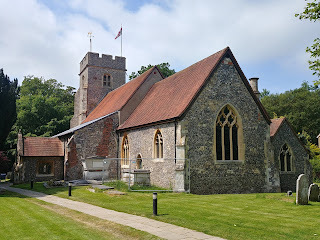 The church is substantial-looking, with tower and turret and clinging masses of ivy; look at it from the road at this side, facing apparently north-west: a four o’clock summer sun lights up its massive proportions, and if you can get far enough back, or as far as the road and your lens will allow, there is a picture to be made." At this point, Bernard heads south-west on his way via Shenley to Radlett. 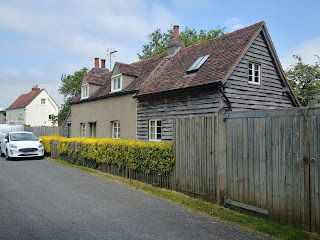 We headed south-east and followed footpaths back to Potters Bar station and the start of the walk. So why didn't Bernard Alfieri include photographs in his book? I asked two of the North Mymmms History Project team for their thoughts on why the author included sketches instead. "Many similar books of this period used drawings – H.M. Alderman in his Notes and sketches in Hertfordshire for example. I think perhaps it was because they were perceived as ‘quality’ and more upmarket than photographs, which would have appeared in newspapers and magazines." Mike Allen, historian, photographer, and digital archivist says it could have also been because of the amount of equipment a photographer would have to carry at the time. 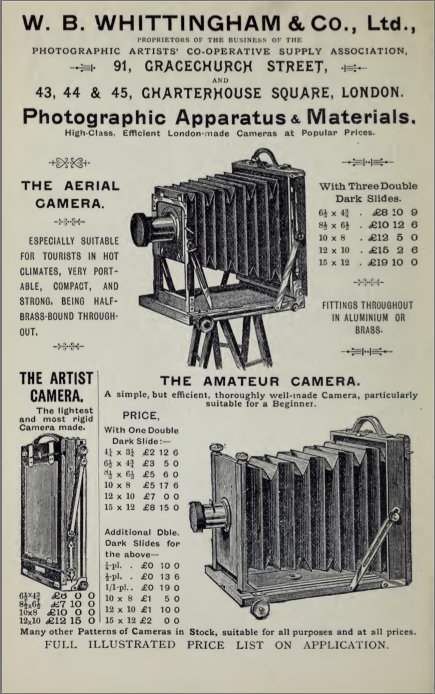 "Cameras in that period would still be the Wooden Plate Cameras with real glass plates, so if you wanted 12 pictures you took six loaded double dark slides with you, plus a tripod, the camera, and the focusing cloth, which amounts to a lot of kit, I think the author was coping out by doing drawings, in the 1910s Mr Eastman had the Kodak with roll film so a big improvement, but quality was a bit iffy." Below is the chapter setting out the walk, and further below is an embedded pdf of the entire book for you to read in full-screen, or download and print. Would you like to do this walk? 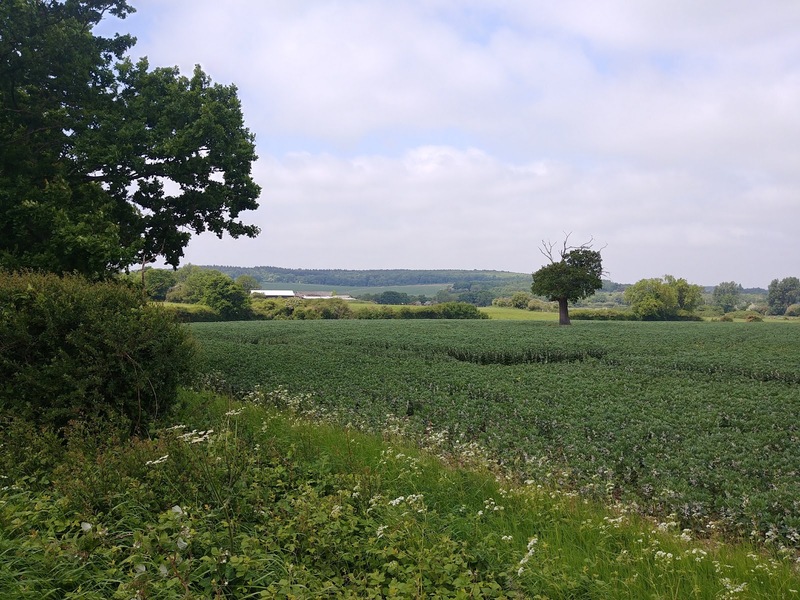 A version of this walk, with a few detours to avoid modern-day major roads, has been added to our Hertfordshire Walker site along with a map, pictures, and a detailed description of the route.